The most frequent complaint I have is from customers who complain that since they’ve installed their multiple carbs, the engine hesitates and stumbles at low speed on normal acceleration, from a stop, even after warm-up. The most blamed culprit is the darn Rochester Carburetor. Usually it is falsely accused! As liquid fuel enters the manifold from the carburetor, the vacuum vaporizes the fuel and causes a chilling effect on the walls of the manifold much like the chilling effect of spraying an aerosol on your skin. Now you have a cold manifold. If you do not supply a continuous supply of heat, the manifold will remain cold and even build frost under some conditions. At this point, if an acceleration is attempted, the vacuum will drop, fuel will no longer vaporize, and will in fact condense on the cold manifold walls until they are completely saturated with wet fuel. This takes about three seconds, during which time no fuel is going into the engine (and thus no power or an extended hesitation). After the walls are fully saturated with fuel the air flow finally picks up this ultra rich mixture and floods some of the cylinders but not all of them because liquid fuel is notoriously bad for equal distribution. More fuel (bigger jets) will only slightly help this problem and actually worsen the over rich condition and spark plug fouling and fuel economy. The solution: Moderate, and continuous heat supply to keep the walls of the intake manifold warm and the fuel in vapor form. Exhaust heat is fast but requires a butterfly valve in one manifold to force the exhaust flow. Water heat is slower but very clean and not corrosive to aluminum manifolds. This method utilizes the water pump to continuously supply warm water to a passage underneath the manifold. (See attached drawing.) It is sometimes necessary to weld a heat channel to the manifold, but be sure to obtain intimate contact between the coolant and the manifold wall or floor. 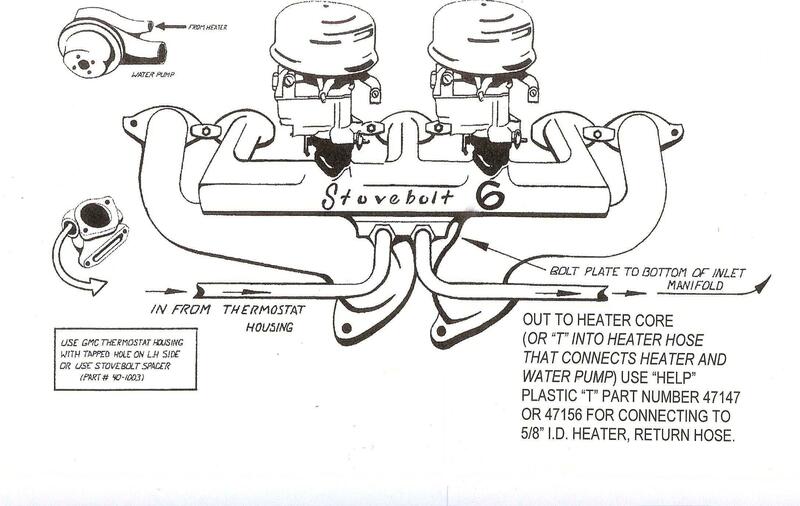 Simply tack welding a closed wall pipe to the bottom of the manifold will not result in sufficient heat transfer.